Hey gang! Lately I have been searching for a good spring race to keep me motivated during these dreary winter months. I have settled on the “Luck of the Irish” 10 Miler in Phoenixville, PA! I have spent hours pouring through several race review websites (www.runningintheusa.com, www.bibrave.com, www.raceraves.com) and it got me thinking…why do I pick one race over another? It really boils down to 5 factors. 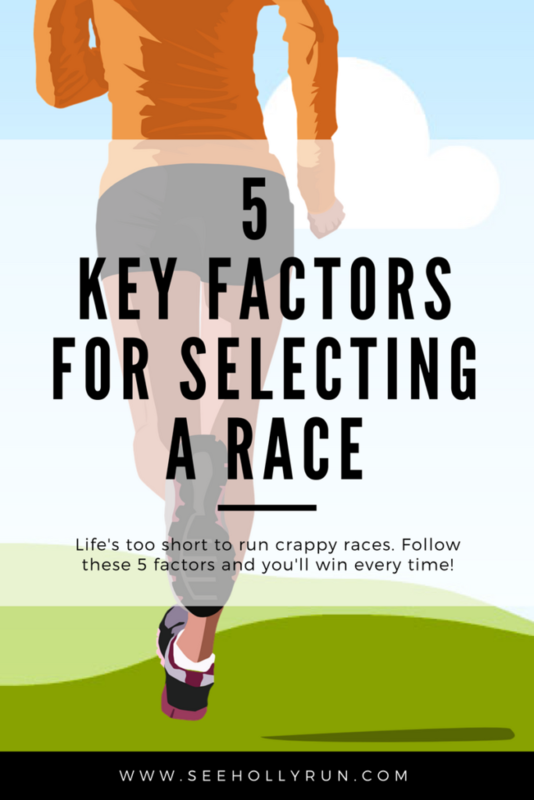 If you stick with these 5 factors when selecting a race, it will save you hours of searching (analysis paralysis anyone?) and you will avoid losing money on expensive race fees. Cost is something to strongly consider when selecting a race. Do not sign up for a big race (e.g., NYC Marathon, Chicago Marathon, etc.) if you do not have the budget to spend thousands of dollars. 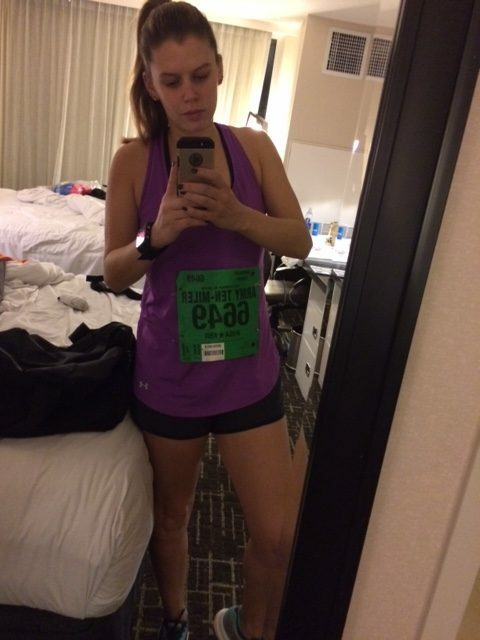 When I signed up for the 2015 Boston Marathon, I was willing to accept the fact that I had to spend $600/night on the hotel alone. When you factor in flights, dining, activities, and race fees, I easily spent around $3500. Could I have done Boston cheaper? Sure. I could have stayed outside of the city, ate cheap food, and did nothing other than run. But that’s not fun for me. I like to travel and experience new things. With that said, my budget for races this spring is pretty tight. Therefore I am running 2 cheaper races, Clyde’s 10k and the “Luck of the Irish” 10 Miler. Each race is only $45 and other costs are minimal. The location of a race is another important factor when selecting a race for several reasons. How long will it take you to get there? How will you get there? Is the terrain different from where you normally run (i.e., mountain versus coastline)? Is it several time zones away? These are all things to think about. A good example of this would be signing up for the Big Sur Marathon (massive hills, west coast time zone) when you typically train on the Chesapeake Bay (flat, east coast time zone). I am not saying it can’t be done, because it definitely can! But did you incorporate hill training into your training? How do you adjust to different time zones? If you find yourself in a similar scenario, I recommend getting to the race location a few days ahead of race day to get yourself used to the time zone change. Surely, the Key West Marathon in January sounds like a delightful break from the running we do in the bitter cold in the Northeast right? Not so fast. It takes about 2-3 weeks to get acclimated to warmer weather. Again, it’s doable but something to consider. If you happen to be in this scenario, I would recommend arriving to the warmer race location a few days ahead of race day to get somewhat acclimated. Although nice, a race necessarily doesn’t have to be the main event. Is there a race that coincides with an already planned trip? Is there a friend or relative you can stay with that lives near a race? Is the race on a holiday weekend so you don’t have to worry about taking time off work? This is one of the reasons why I chose the “Luck of the Irish” 10 Miler. My boyfriend’s parents live near the race start and we will be visiting them that weekend anyway. So it keeps costs down because I don’t have to stay in a hotel or worry about any other additional travel costs. #5 Does it make you feel excited?! This is the #1 factor when choosing a race. You may have everything else lined up; budget, convenience, etc., but if you don’t feel excited about it, DO NOT SIGN UP. There have been plenty of races where I thought “oh man it’s not very expensive and it has good reviews”, but I just didn’t feel excited about it. If you don’t feel excited about signing up, then I can guarantee you won’t feel excited come race day. What’s helpful for me is googling “[Insert Race Name] race reviews” and other blogs will appear in the results. It’s a great first-hand account of what the race is really about. To help me keep track of races that peak my interest (so many! ), I made a Pinterest board called “Places to Race“. So tell me, what are other factors that help you select which race to run? Click “Leave a Comment” under the blog post title. Hey friends! Hope everyone enjoyed their weekend! 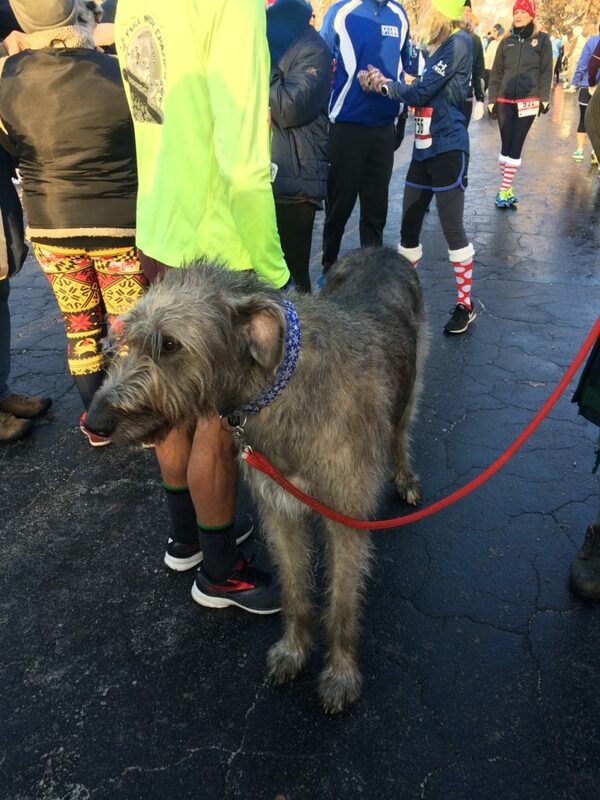 This past Saturday, I ran the Celtic Solstice 5 Miler in Baltimore. 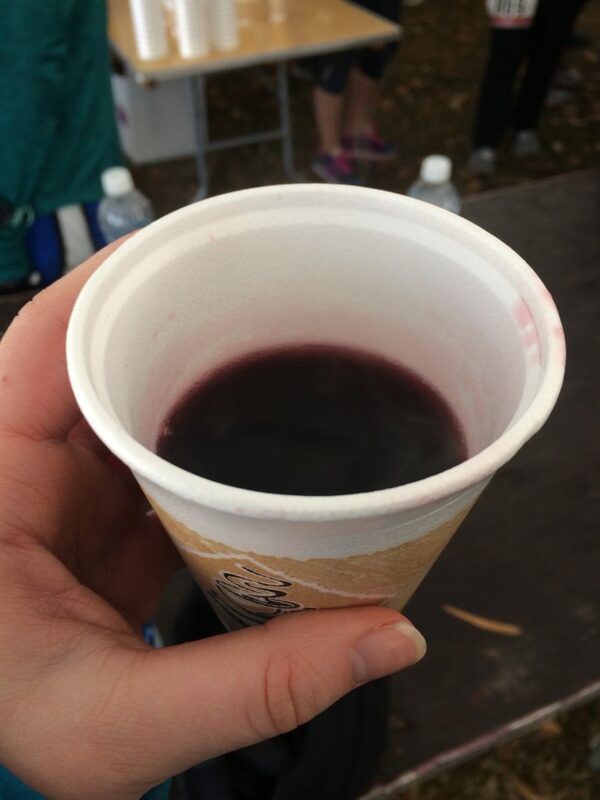 With the race start being at 8:30 am, my running partner and I decided to leave our ‘hood by 7 am to give us enough time to get there, park the car, and use the port-a-potties. Thank God we did leave early because we thought we would be smart and take a back road to the start area (the Maryland Zoo). We did this because the main way to get to the start is a short exit off the main highway and every year it is notoriously backed up and you are just waiting. Well when we tried to take the back entrance into the zoo, it was closed off. Womp womp! Then we drove around to the front of the zoo, where Santa was waving in traffic to another parking area. Well we must have been on the naughty list this year, because when we pulled up to the lot the attendant (Santa’s helper?) told us the lot was full and we would have to find another lot. So we turned around and were luckily pointed down another road, where we parked right at the start!! Score!! 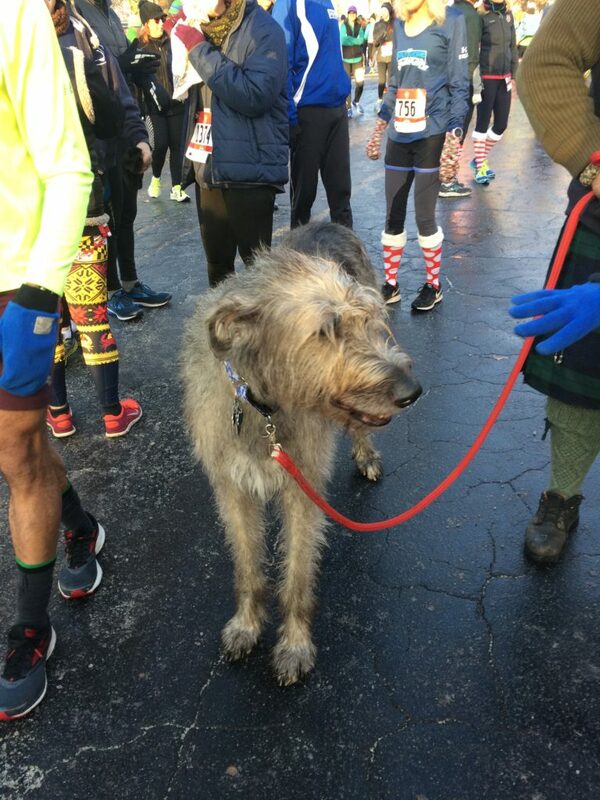 After parking, I quickly spotted the Irish Wolfhounds that kick off the race each year. I love petting these gentle giants! This boy was 165 pounds! Soon enough, it was time to start the race! We all had to walk up the road and turn around to run the other direction. Kinda awkward and it was packed. I couldn’t see the bag pipe march with the dogs but I sure heard it! So much fun! Then we were off! It snowed the day prior so I had to watch my footing but the race route was pretty well salted. Mile 1 was crowded but honestly, I do this race for fun. If you follow me on Instagram, you know my fitness watch broke a few weeks back. That allowed me to not be constantly looking at my time and just enjoy the scenery. The course goes through Druid Hill Park, which is America’s third oldest park. Oh, and it’s hilly as all get out. It was fun to run by all the quirky features of the park such as an old graveyard, pools, tennis courts, a K-9 Police Unit, and the Zoo. By mile 4 I was feeling the hills but knew the last mile would be over quickly. 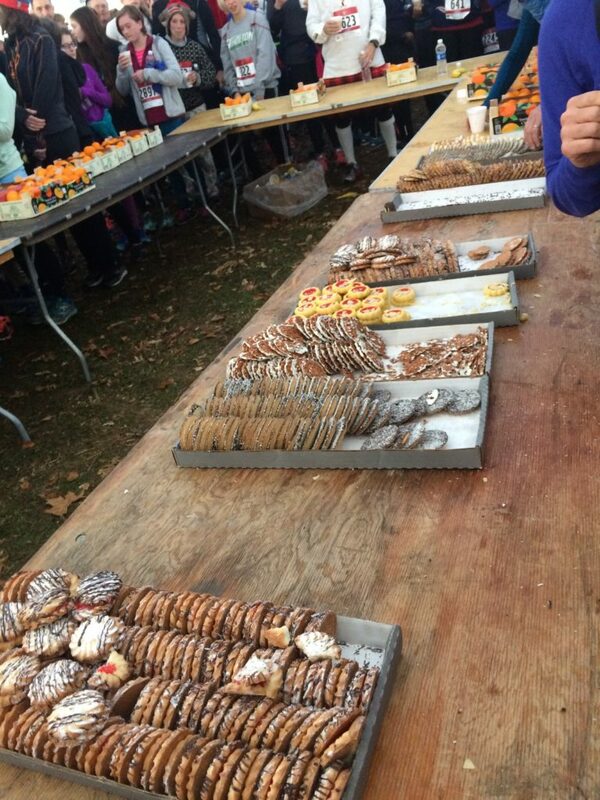 Basically, the post-race food is the reason why I run the race. 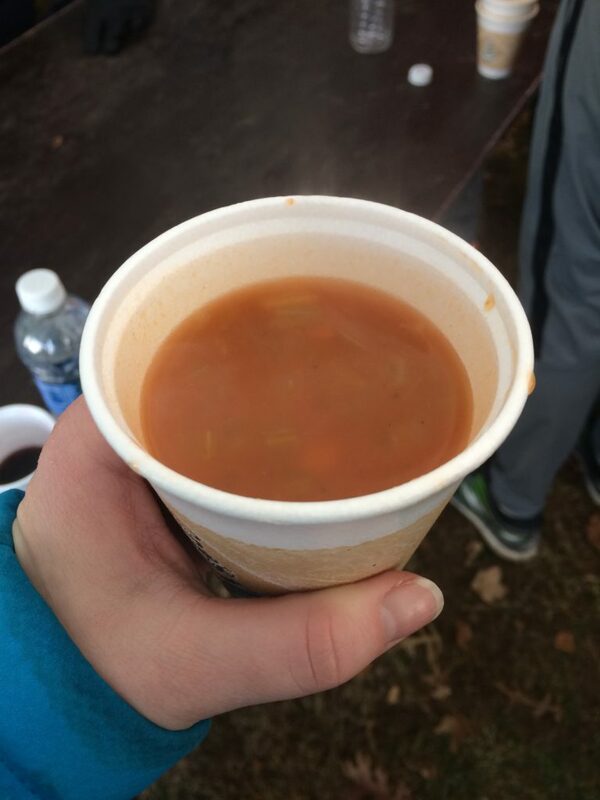 Other than the mulled wine from Boordy Vineyards, there is delicious soup (think it was vegetable soup?) 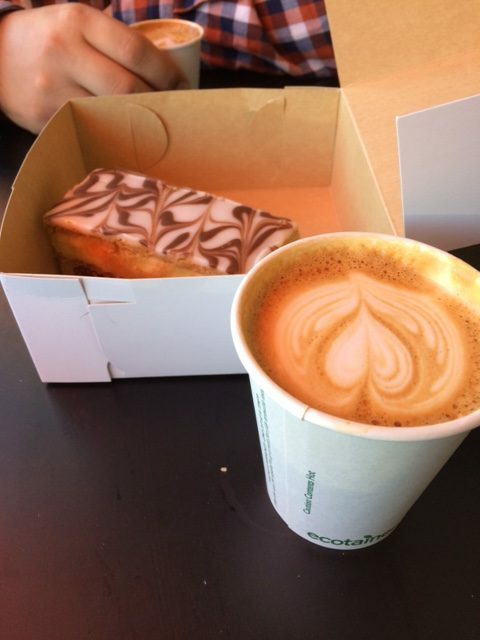 from a chef in Baltimore, Italian cookies from Trinacria Deli in Baltimore, and coffee and hot cocoa from Zekes. 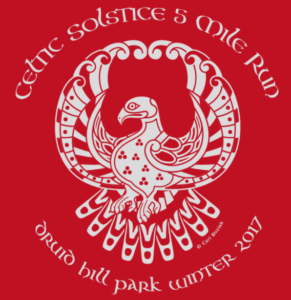 Another fun year at the Celtic Solstice in the books! Hey friends! Hope everyone had a nice, relaxing Labor Day weekend! Why can’t every weekend be 3 days?! 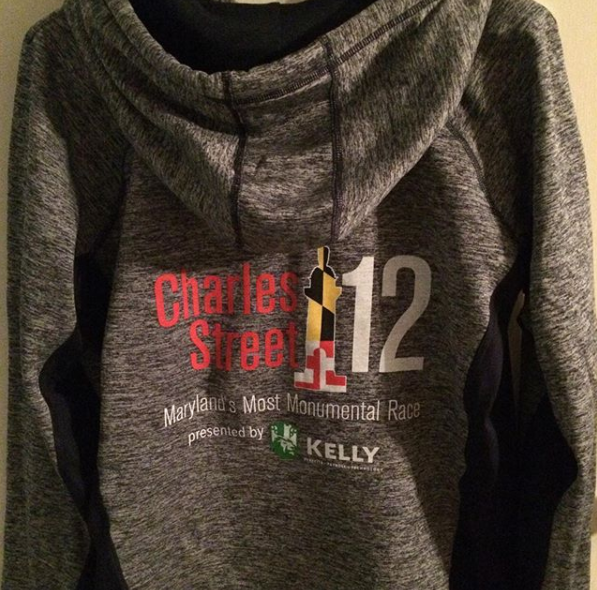 I definitely needed the extra day to rejuvenate and recover because this past Saturday, I ran the Charles 12 in Baltimore! 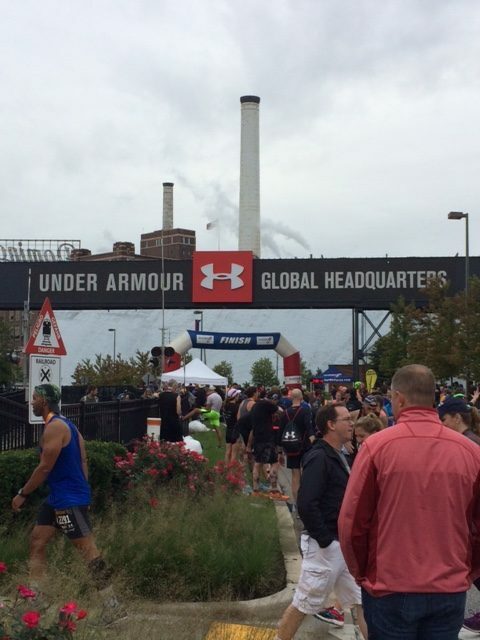 The race starts at The Shops at Kenilworth in Towson and ends at the Under Armour headquarters in Locust Point in Baltimore City (12 miles. Hence the 12 lol). In previous years, the course ended at Power Plant Live. So you had to run about a mile past Power Plant Live into Federal Hill and turn back around to run back to Power Plant Live. Talk about torture! I much prefer the finish at Under Armour because it’s a straight point-to-point course and finishing at Under Armour makes you feel a little badass. Miles 1 through 4 are pretty hilly, but after that? Smooth sailing all the way down hill! Makes for a pretty fast time. I mean look at this elevation chart! Charm City Run (the race host) offers a shuttle (additional $5 at time of registration) from the finish line to the start line. Ideally you’d park at finish area and then catch the shuttle to the start. While this is a great idea and works for many people, it doesn’t work for those who live in Towson or west of Towson. I would have to drive past the start, get to the finish area early to catch the shuttle, and then schlep back to the start on the bus. My running partner and I opted to drive to the start, park our car next to the shops, and then catch an Uber back to the car from the finish. So was this a better solution? Not really. The Uber wind up costing us $45 and to wait for it to arrive took forever! Next time we will just wake up 2 minutes earlier. The weather forecast for race day was pouring down rain. 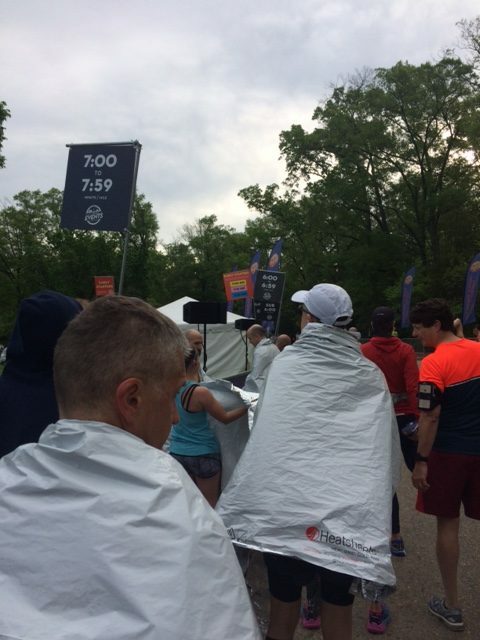 Luckily, the race offered bag check so you can check warm and dry clothes to have at the finish. What a lifesaver! By the time I finished, I was soaking wet and after a few minutes, got VERY cold. 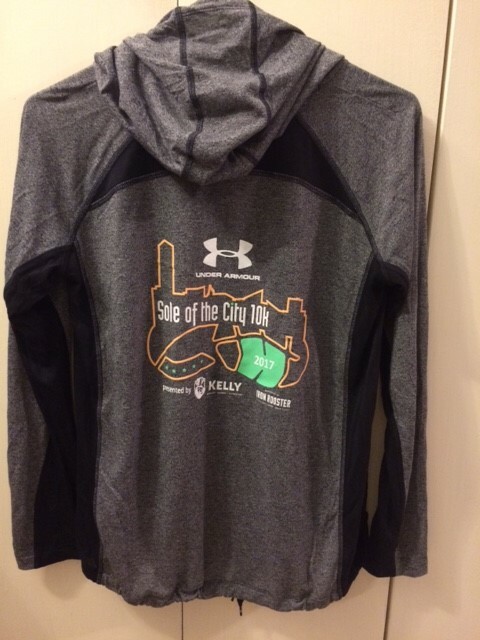 The race always hands out a nice premium by Under Armour and is worth the cost of the race entry alone. This year, we received a very nice and thick Cold Gear hoodie. This year the race had a selection of food trucks at the finish area and a meal ticket was on your race bib to redeem at any truck you choose. While I really like this idea, it was poorly executed. There were 4 food trucks and they all seemed to serve the same breakfast sandwich? Maybe I’m wrong but that’s all I saw posted on each truck and that’s what everyone was munching on. Plus the lines were incredibly long. So I didn’t eat anything because the wait was crazy and we were ready to go. The National Anthem was sung by an incredibly talented young girl. Like, she could sing at a pro-football game good. The police support was on point! Thank you police officers for keeping us safe! This ranks up there as one of my favorite races. Army Ten Miler holds the #1 spot for me but Charles 12 is in the top 5. Definitely sign up! Me, all smiles, with my race medal! So tell me, what’s on your fall race schedule? Packet pickup, located at the Pacers Running Store in Alexandria, was only about a mile away from our hotel. I love how Pacers organizes packet pickup. First, you can pick up for multiple runners without any kind of signed permission slip or ID. They also always have multiple people handing out packets so there are no lines to wait in. 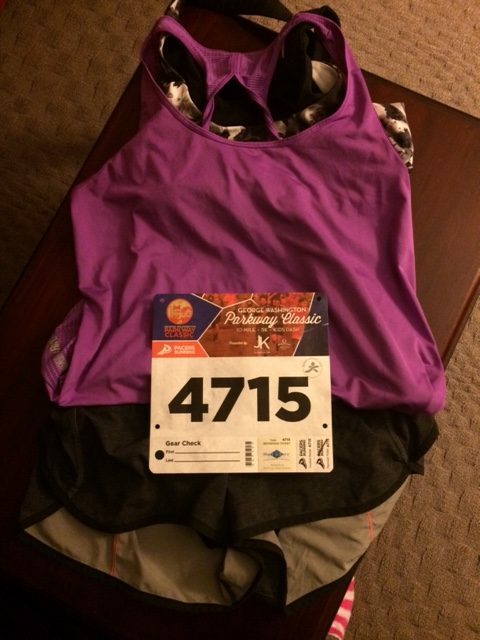 Later that night, after a quick dinner at T.J. Stone’s, we settled in and I took a picture of my race day outfit so my boyfriend would be able to pick me out of the crowd during the race. I definitely suggest doing this if you have someone coming to watch your race. We got to the start area about an hour prior to the start, which left plenty of time to use the porta-potty (a must!) and check a bag. 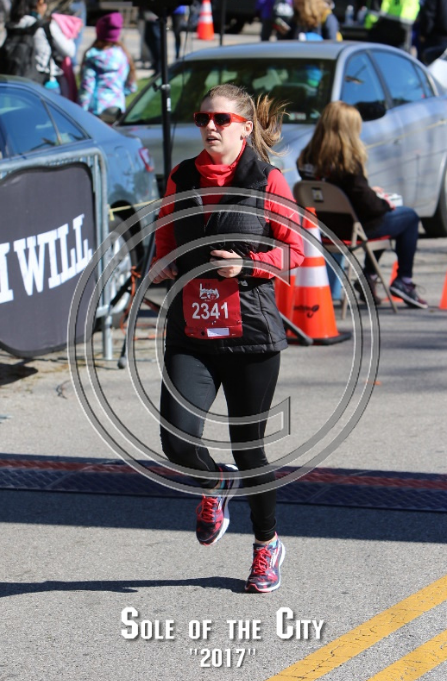 I am so glad I decided to check a sweatshirt because it was freezing again once you crossed the finish line. No one wants to stand around sweaty and cold! Just before the 8 a.m. race start, I lined up at the 7:00 to 7:59 minute per mile group and we were all smiles event though slightly cold. Danggggg!! 😛 That was 16th out of 511 females ages 30-34, 59th out of 2,635 females, and 298th out of 4,482 people!! Even though I didn’t break my goal of a 1:09 performance like I had wanted, I am still proud of myself. 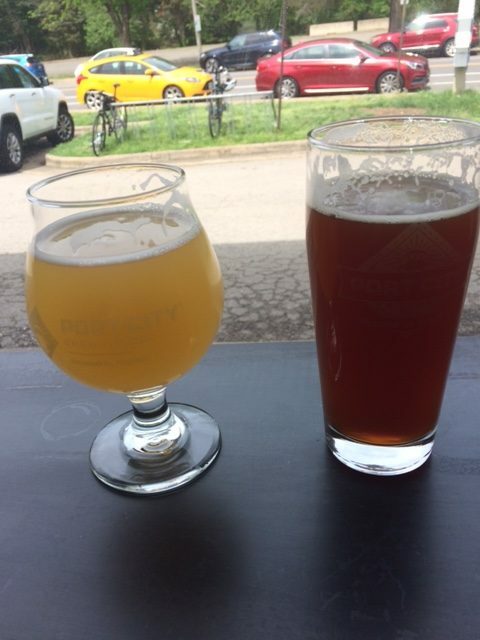 A performance like that calls for a nice cold one, so my boyfriend and I stopped at Port City Brewing Company to celebrate. Hey friends! How was your weekend? 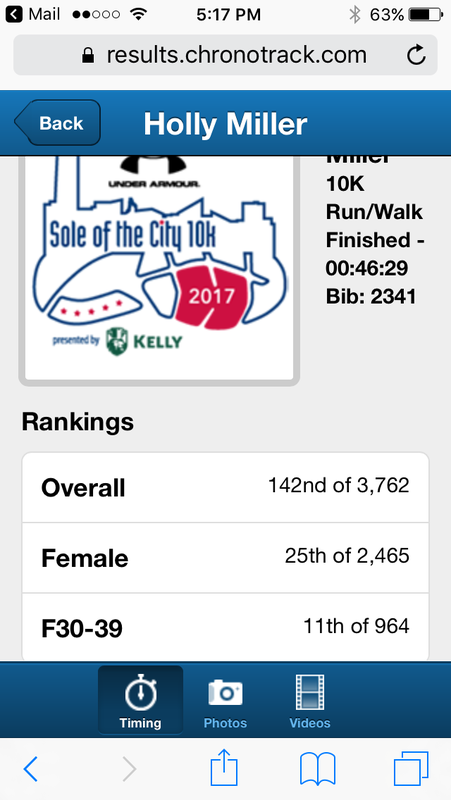 On Saturday I ran the Sole of the City 10k in Baltimore! Packet pick-up was earlier last week and I got to pick up this sweet premium from Under Armour. Do not be deceived. This hoodie is VERY thin. Basically I would only wear this walking around in 65 degree weather. Yeah, so not really a hoodie LOL. The packet pickup itself was at Charm City Run was pretty well organized per usual. Race morning came and it was a freezing 35 degrees out! Brr!! But then the high for the day was 60 degrees. Even though we lucked out with sunshine, this weather is hard to dress for. In order to be warm, I wore a crappy goodwill hoodie to the start area, which was located at McHenry Row. When I woke up that morning, I really had no desire to “race.” I thought I would just enjoy the run. But then of course, my friends egged me on! They wanted me to win. Well, I guess it didn’t take much to get me all fired up because I easily agreed and felt the fire in my belly! 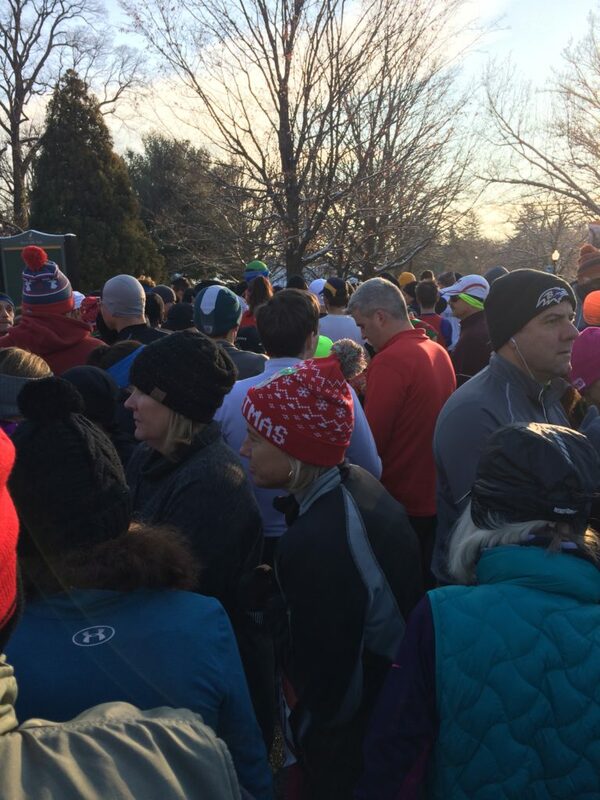 After hanging out at McHenry Row and chatting/shivering, around 8:45 a.m. we made our way to the start line. It was a short walk and not overly congested. I said goodbye to my friends and headed to the front of the starting line. After a BEAUTIFUL rendition of the National Anthem (seriously that girl had some pipes! ), we were off! Mile 1 ran through Federal Hill and to the Inner Harbor. I was feeling good and was trying to gauge the competition around me. I did have a guy run next to me panting like a dog. There was no way I was going to let him beat me! So off to mile 2 I went! Mile 2 was around the Inner Harbor and running toward Harbor East and Fells Point. I noticed there was not much of a crowd, which was a bummer. The cold air probably didn’t help. 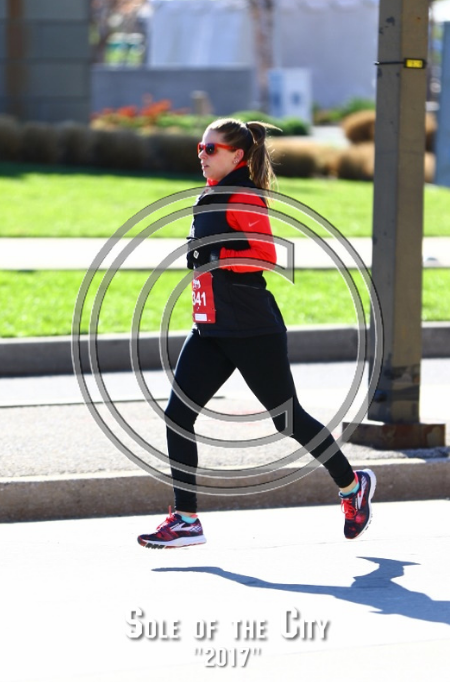 I still felt pretty good at this point as captured by this race photo. I mean look at that stride! Mile 3 was pretty much the turnaround point at the edge of Fells Point and took us back to the harbor. At this point in the race it started to warm up I was feeling a bit warm. At mile 5, I was hot. Like, nearing overheating. But with one mile left I was determined not to slow down. I wanted to place dang it! Mile 5 was back through Federal Hill and the finish line was back at McHenry Row, where we started. Here is a shot of me crossing the finish. No, I normally don’t look that good 😛 I was WIPED! I gave that race everything I had! Note how the gloves came off. Literally and figuratively, ha! After the race I waited for my friends to gather again. I grabbed a free beer but frankly I do not want beer after a race. I pretty much take three sips and give it to a friend. Unfortunately the food after the race was seriously lacking. We got chicken salad, but really it was an onion salad. You can just smell the stench through the box. It didn’t appear anyone wanted an onion salad after a race because most people didn’t eat it lol. We waited around to see if I placed, but no dice! I was disappointed initially. Then I got an email with my results. BOOM! Like 25% percent of the field was female 30-39. Lots of competition! But considering that, I feel pretty darn good about my race. So would I do it again? Meh, the jury is still out. I didn’t think the course was anything special. I am leaning toward “yes” but only because I would like to get on the podium next year. Let’s see what I can turn out at the Parkway Classic! 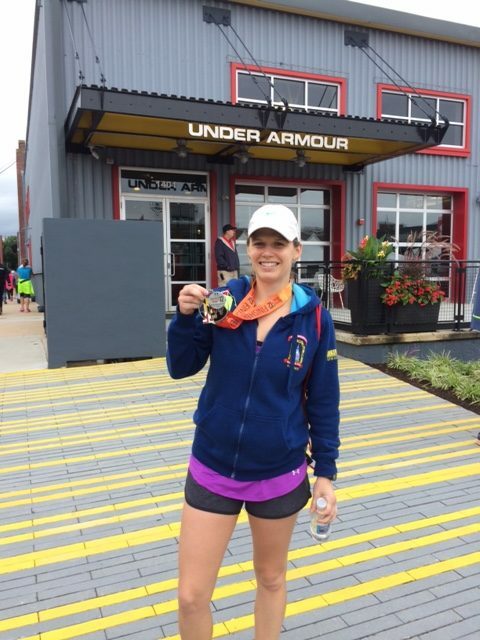 On October 30th, I completed the Marine Corps Marathon in Washington, D.C. My 10th marathon! Because why stop at 9? 😉 Marine Corps Marathon is one of my FAVORITE races. You cannot beat the level of patriotism and support at this race. I went into this race with a goal of finishing, no time goal. I signed up for the race spontaneously, after I received an email from the Road Runners Club of America (RRCA) stating that RRCA certified coaches can sign up for $40. I couldn’t even spell “no” to that offer! So I signed up with about 2 months to train, about half the time needed to properly train. But my base mileage had been pretty consistent for a while. On race morning, I drove to D.C. (about a 30 minute drive) and parked at the Crystal City parking garage (for free!) at around 5 a.m. Yes, it is an early start but I will always tell a fellow runner to get to the start area early to avoid long port-a-potty and security lines. 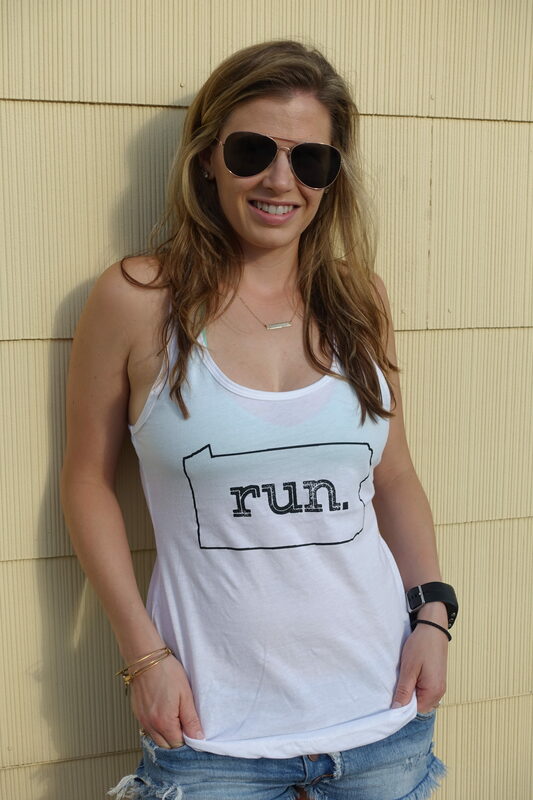 The last thing you want is to be rushing around panicking before you run a marathon. So I got through all the lines early and gave myself plenty of time to line up properly at the starting line. A lot of people do not realize that the start area is a good walk away from the actual start line. Maybe about a half a mile away? The race starts at 8 a.m. but I left the start area around 7:10 so I can see the fly over, which is just prior to the start. I was able to catch some of the fly over on video. So cool to watch it again even after the race! And here is my happy face after that fly over! Mission focused! Yes I am wearing a crappy old hoodie so I can stay warm haha. 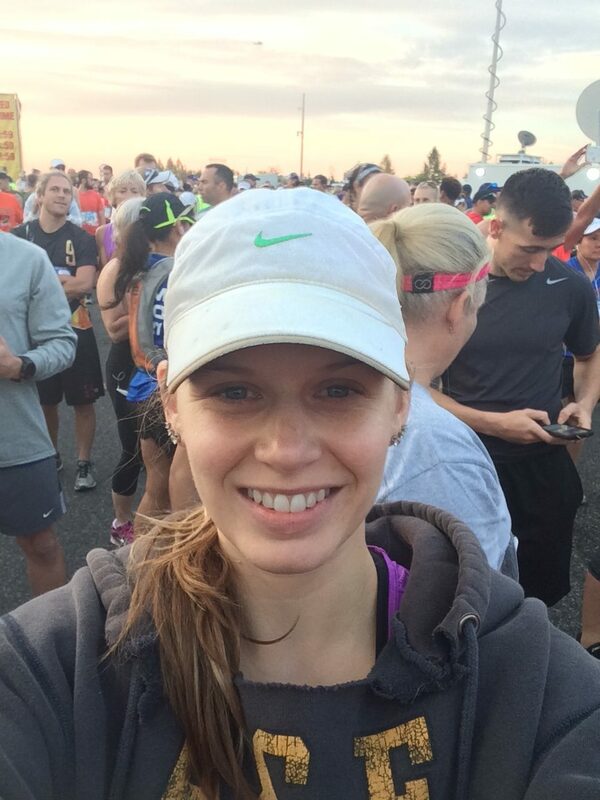 Another tip for Marine Corps Marathon, wear a hat or sunglasses! The course does not have a lot of shade so the sun will definitely be in your eyes at several points on the course. Miles 5 through 9 are smooth sailing. All the spectators are still lining the streets and the energy is high. At mile 10 though, you are entering Hains Point. I have to be honest guys, it gets lonely here until about mile 13. There are not a lot of spectators and the scenery leaves something to be desired. One special aspect of Hains Point is the blue mile. This year it was between miles 10.5 and 11.5. Every few feet there was a sign with the picture of a marine who was killed in action. It is a VERY emotional part of the course and allows you to silently thank those who have served our country. Don’t worry though, miles 13 through 18 are back to the cheering crowds and help you get your mind back in the race. But at mile 18, you will start your journey to “the bridge”. Yes, everyone just calls it “the bridge”. It’s just a long, boring bridge until mile 20. At mile 18 someone was giving out watermelon Jolly Ranchers. I grabbed one and prayed that I’d make it over that bridge! My pace started to drop a bit here, but I expected that due to my tight training schedule. I made it to mile 20, which at that point you run around the Pentagon parking lot and into Crystal City. There is a TON of spectators lined up with food for the runners. I have seen animal crackers, oranges, soda, donuts, Swedish Fish. You name it and it’s probably there. I have to admit, Crystal City is always rough for me. I hit the wall and as much as I want to get into the spirit, I am focused on just putting one foot in front of the other. You leave Crystal City at about mile 24 and it’s gut check time! Again, it’s pretty lonely until about mile 25.5. At this point in the race, I have not stopped to walk. For me, if I can run an entire marathon and stay mentally strong, I consider that a good day. I crossed the finish line in 4 hours and 12 minutes. My slowest marathon time yet. But you know what? I am not any less proud of the effort I put forward that day. If you are looking for a well supported race course, with a ton of camaraderie and patriotism, this marathon is it. I recommend this race to everyone as a must do! I am so thankful to all our men and women who serve our country. A country where I am free to run and achieve my goals! Disclaimer: I was not compensated by any of the companies mentioned in this post. These are my opinions and mine alone. Last Sunday, October 9th, I had the great honor of running the 32nd Army Ten Miler in Washington D.C. If you live in the area, heck even if you don’t, you NEED to race this race. The day before the race, my running buddy and I headed to the expo at the DC Armory for packet pickup. I love the fact that it’s at the DC Armory because there is plenty of free parking and it’s located just outside of D.C., making getting in and out of the city a cinch. TIP: Go to the expo about 2 or 3 hours prior to closing. Race gear (shirts, hoodies, mugs, etc.) will be steeply discounted. I bought a hoodie, a tech shirt, and Tervis travel mug all for $40. Score! After the expo, my running buddy and I drove to our hotel, the Hyatt in Rosslyn, to get settled in before dinner. Any time we are running a big city race, we like to stay in a hotel the night before. It just makes race morning logistics a breeze instead of worrying waking up wwaayyyy too early and hitting gnarly traffic. 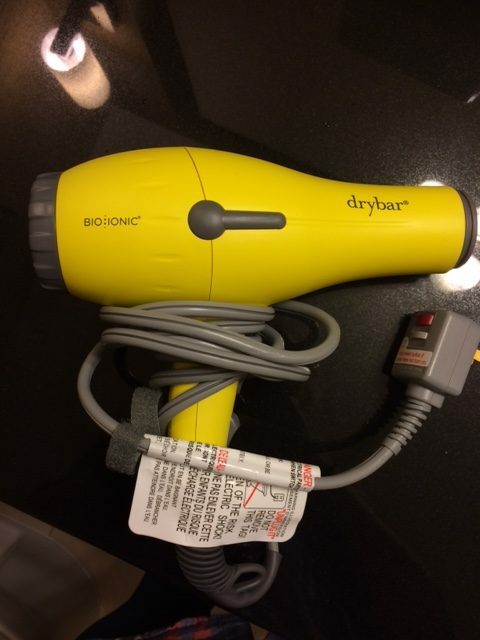 And check out this blow dryer that was in the hotel room. Way to step it up Hyatt! After unpacking, we were ready for dinner. Panera Bread is always a safe bet. Not too heavy but still filling. For me personally, I do not find it necessary to carb-load for a ten miler. I stick with a broth-based soup and sandwich. Another perk to eating Panera the night before a race? You can get your morning bagel too! So fun story, the forecast for race morning was sunny with heavy winds and temps around 70 degrees F. We woke up at 5:30 am to 50 degrees F and rain. Whhattt?! So what did I wear for the race? A tank top and shorts of course. 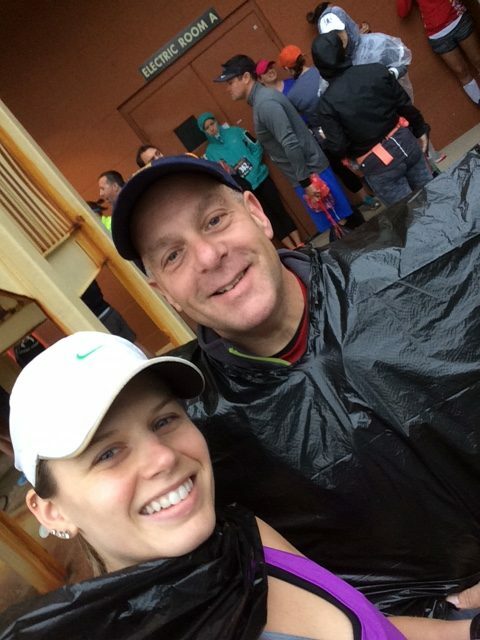 Luckily, we always bring “throw-aways” (aka old, stained hoodies) to our races. We swear by it! Why waste energy shivering before the race actually starts? Luckily by race start at 8 am, the sun was out and it was starting to warm up. I absolutely love the start of this race. Normally the Golden Knights Parachute Team will jump with the American flag and land dead center on target, but this year because of the winds they were unable to do so. Total bummer! 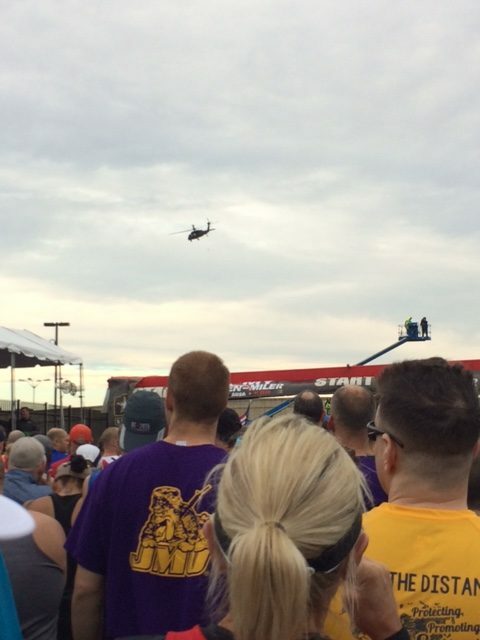 But at least there was the flyover of four UH-60 Army helicopters to kick off the race. I did catch a picture of one right before the start. My game plan going into this race was just to have fun, but after the first mile I was feeling really good. Plus, I knew my boyfriend was waiting for me at mile 6. So that was definitely another reason I was feeling quite speedy! Cons: This is kind of a given since it is D.C., traffic trying to leave the race can be a nightmare. Roads are closed and it is very congested. 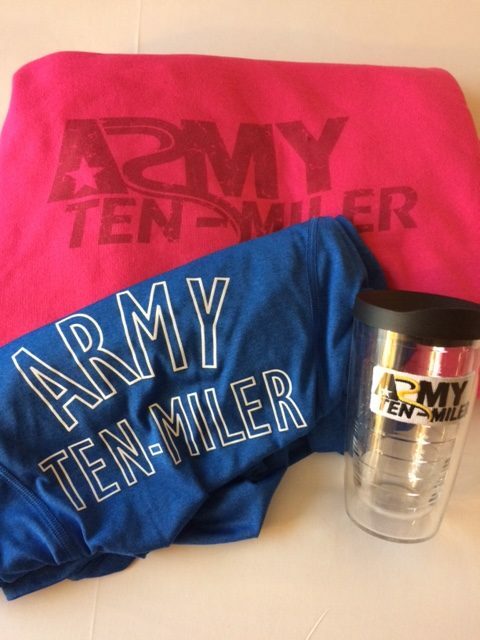 See you next year Army Ten Miler! !